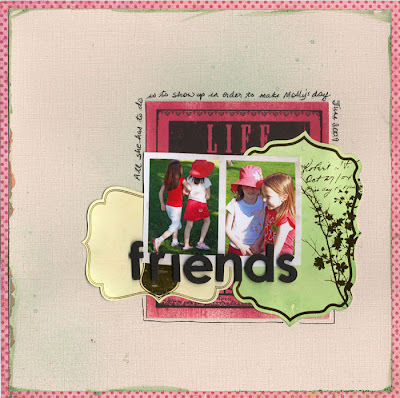 This assignment was waaay out of my box - I'm a clean and simple, non-technique scrapbooker but I have to admit that playing with mists was a lot of fun. 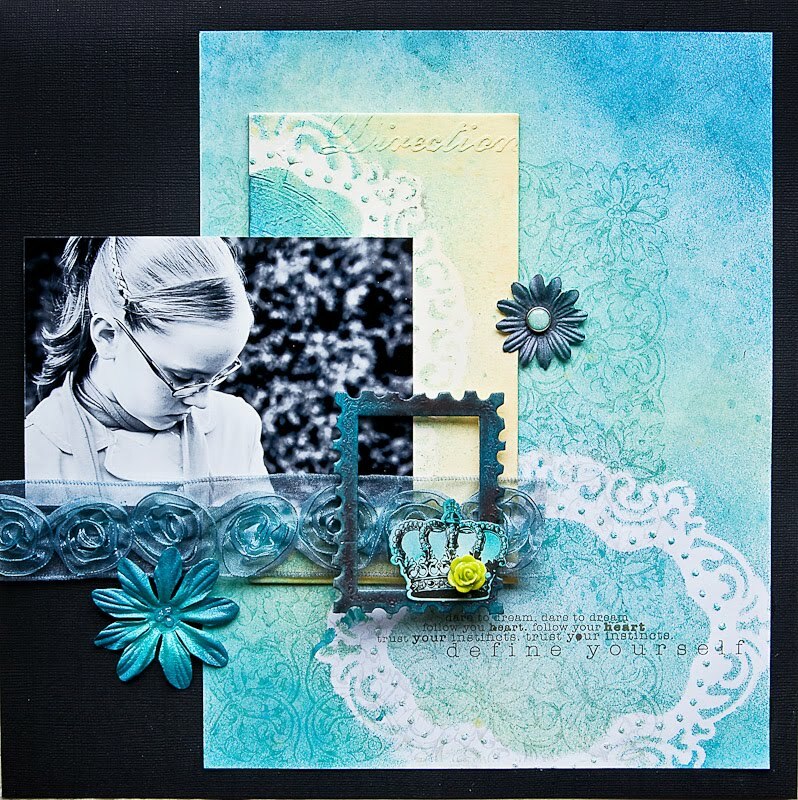 The chalkboard mist was definitely my favorite - I loved the color and the effect.The Tattered Angels chipboard is very different from regular chipboard and it takes mist much better than regular chipboard (which I also tried). I even tried using the mists on regular chipboard which had been painted with gesso and it still didn't look as good as the Tattered Angels letters/frames/shapes.I used the masks on a sheet of Core'dinations cardstock with a few different mists for my "art" layout. I had more success with the less intricate shapes but this could be due to my lack of mist knowledge!The Tattered Angels cards and bingo cards really take mists very well - I used the mists to completely change the colors and used them on the friends layout. 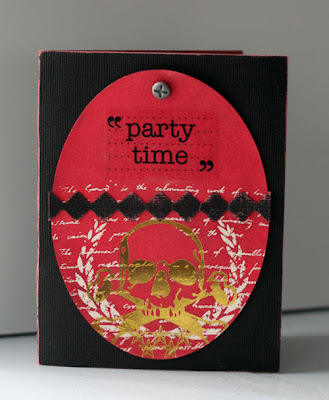 You can see the resist effect with the mists on the "party time" card - definitely a fun item to play with! The only item that I didn't really have the best results with was the Glimmer Glam. I wasn't completely sure how to use it and some of my attempts ended up a disaster! 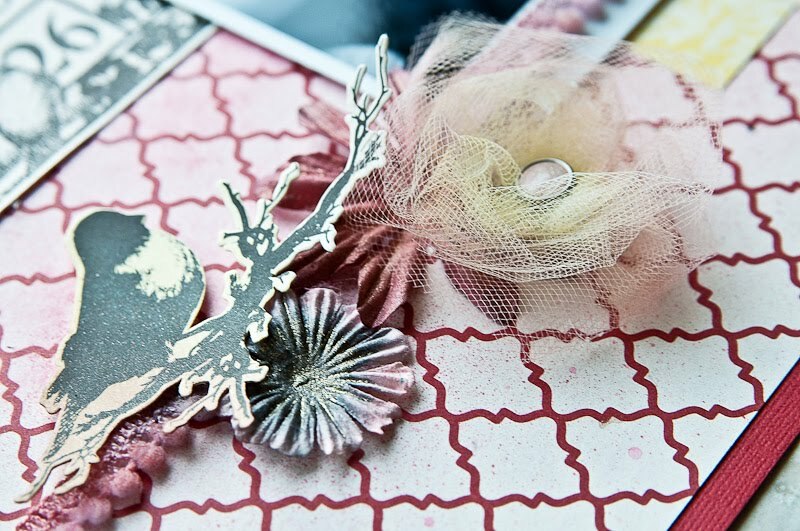 Supplies: Core'dinations cardstock, Tattered Angel mists and calling cards. Have you ever seen one of those infomercials where it ends with you thinking, "I really could use some of that stuff!"? Well let me just tell you, you could really use some of this stuff! It's fun, it's shiny and it's just a tiny bit messy. Don't worry, it's the fun kind of messy, and the kind that requires only about 30 seconds of clean up. (That's my favorite kind of messy!) Every scrapper should have one or two (or fifteen) bottles of Glimmer Mist on hand. You can add instant jazz to backgrounds, distress pictures, recolor flowers and so much more. And did I mention just how easy it is to use? Just lay down a couple of paper towels, add your mist-able object and spray to your heart's content. 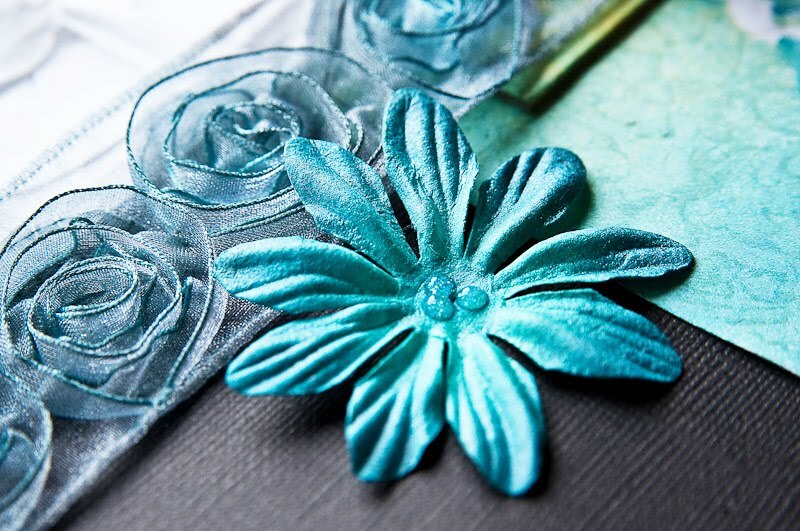 Layer and blend Glimmer Mist colors on your projects with just the push of the spray nozzle button. Yes crafters, this is the product you've been waiting for... fun, fast and all around fantastic! But wait, there's more! Stock up on Glimmer Mist and watch your kids or grandkids swarm the counter wanting a piece of the action. That's right, fun for the whole family! Glimmer Mist has it all folks! Seriously though, I did have a lot of fun misting everything I could get my hands on including coffee filters, flowers, patterned paper, cardstock, chipboard, ribbon, photo paper... shall i go on? I especially loved making custom colored flowers out of coffee filters. I even enjoyed a little hybrid project, printing out a digital overlay and quote then coloring it up with a few colors of Glimmer mist. Stock yourself up with a pile of fun colors and have some fun misting your way through some scrappy fun. What do you think? Leave a comment by midnight EST Thursday to be entered to win another prize from Tattered Angels!! Wow! These example projects are just gorgeous! Thanks for the review. I have some glimmer mists and screens, but have had varying levels of success using them. Your review makes me want to get them back out and try it again. 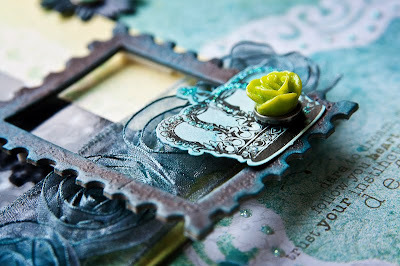 I would love to have some of those chipboard pieces to see hwo well they really work, plus they make gorgeous designs. I haven't tried Glimmer Mist just yet, and I was trying not to, but "i could really use that stuff". I'm having a hard time finding flowers for my three sons but I'm going to look into the coffee filter technique. I love tattered angels. I must admit I have several bottles of glimmer mist that have never been touched, though. I really need to get those out. Love the projects today! Would love to try Glimmer Mist. I currently make my own and would love to compare the differenced! Thanks for a chance to win! I just recently bought some of the masks and love the effect they have on my pages! Misting is addictive! I have not even thought about trying Glimmer Mists until these reviews. But know I am rethinking my decision not to buy anymore new items. Will have to hit the LSS stores this weekend. Good thing we are busy at work and I am getting in some overtime. TeeHee. I am thankful that my boss believes that we should not be open on Saturday or Sunday. Sounds like a good L.O. to me. I've never tried this stuff, but I've seen in on LO's everyone. I'm scared, but tempted to try it out. I might become addicted though after first use! Beautiful layouts! I have glimmer Mist and love it! 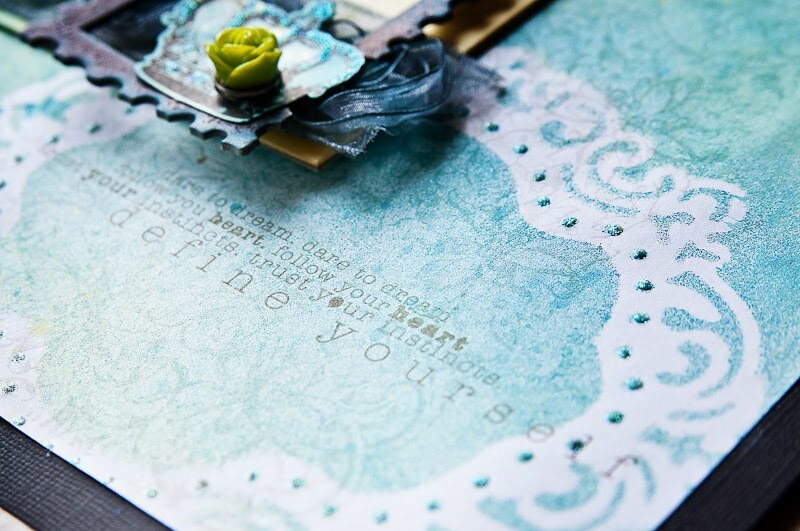 Now I want to try their chalk mist and the chipboard! I'd love to try the chalk mist! I've tried Glimmer Mist and haven't fallen in love yet... I think I need more practice. Thanks for the inspiration. I love these layouts and cards! I have got to buy some of this! Wow, how pretty!! I only have a few Glimmer Mists and have been playing around with them. I'd love to try out more techniques with them! Thanks for the ideas! This looks like this would be alot of fun to play with. I know my daughter would LOVE it. I think I might have to try it out. Thanks for the review, girls!!! These are all wonderful! That tag is just fabulous! I am so in love with Glimmer Mist! 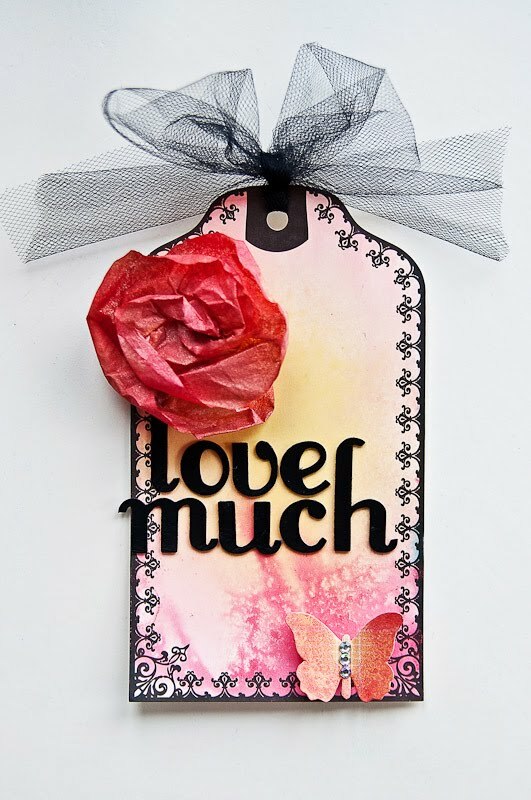 I love all the Tattered Angels products! I'm a big fan of glimmer mist - I dreamed once that it was the only thing I rescued from a house fire! I recently added a few new colors to my collection (which before that was 1 bottle), and I played a little over the weekend. I love love love your projects. I'm inspired to try it again this weekend!! Would love to have more colors & some of the masks & chipboard! Great Review...thanks! All these neat projects make me want to try Glimmer Mist! I Love TA Glimmer Mist! Thanks for sharing your projects. I can't tell you enough about how much I love Glimmer Mist! Your projects are absolutely fabulous! You rocked the Glimmer Mist!!! I really want to try Glimmer Glam. Can you elaborate more on what you were doing that you were having difficulty with? Any Glimmer Glaze on these projects? That's another one I want to try! Thanks for the reviews...and the projects! I love seeing this stuff in use! thank you for this great inspiration!! i love them!! The project are fantastic. Such great talent. I can't wait to try the chalk spray. Thanks for the chance to win. Lovely, L.O.V.E.L.Y. samples showing the Glimmer Mist! I don't have the chipboard or Glimmer Glam, but it sounds awesome to try! Thanks for the inspiration and the chance to win some! YES, these are absolutely BEAUTIFUL. YES, i need GLIMMER MISTS! 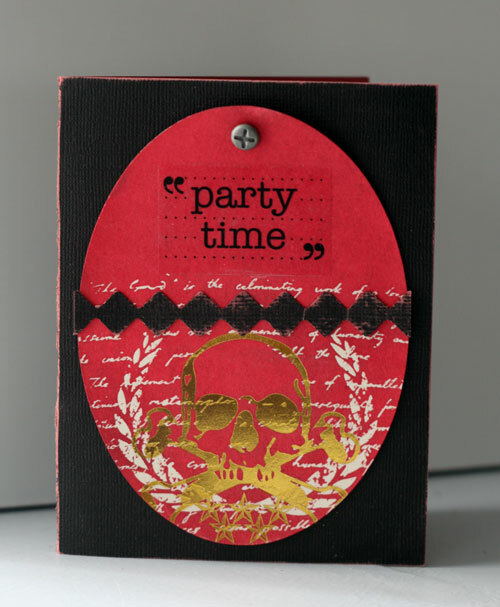 YES, i'm DYING to try that chipboard. YES, i love to alter the bingo cards and spray the heck out of my flowers, ribbon, cardstock, whatever! nope, haven't tried the overlays, but now i think i shall! nope, never played with the Glam, but my curiosity is PIQUED! must have! thanks for these wonderful reviews and inspiration! Beautiful projects and layouts! Love them all! Can't wait to try this product...thanks for the chance at winning something fantastic yet again!! Great projects; I'd really like to try some of that chalkboard mist. I've never seen it anywhere around here. Hello all, loving what you're doing with the glimmer mist! Love it! Love your projects, love Tattered Angels! Ok, I was sure I wasn't going to get into the whole misting thing. I may have changed my mind now after your review! I love the projects and am very interested in trying some now. I've not used any of the Tattered Angels products but would love to give it a try. Paula and Noel's projects look fabulous! TFS, ladies! Wow, that looks like a lot of fun to play with! After looking at all these gorgeous projects it is clear I need several more bottles of glimmer mist! LOL! I love the projects shown. I have a couple bottles of GM but I'd love some more and I am dying to try the chip board. I haven't tried Glimmer Mist, but your reviews have me itching to get misting all over my layouts. You all do the greatest reviews. Your projects are gorgeous. I love the look of glimmer mist, whether it's used a lot of a project or a little. Gotta give it a try. Wow!!! Amazing samples! I love how the Calling Cards were misted. I have had some for awhile and weren't sure how to use them! Love the effects using masks and that coffee filter flower is adorable!! Thanks for another wonderful review on such an awesome product! How about a review of all the mists together - Smooch (I think thats what its called), Glimmer Mist and Maya Mist. A chart that shows all the differences, if there is any? I have a few of the Glimmer Mists and use them for various effects. I like the splattered look and the mist effect both. I'm looking forward to trying the new releases as soon as they hit the LSS. Love getting the inside scoop from TSR! Wow, your projects are all so beautiful!! I haven't mastered the glimmer mists yet, but have given them a try with a few masks. I love the look it gives a background page as well. I have not tried it yet, but it does look like good and messy fun. Thanks for a chance to win. Love those colors, especially the aqua blue (not sure what TA calls it). The chips and tags look interesting also but have not seen them at my LSS yet. I LOVE LOVE LOVE Glimmer Mist, I must have about 30 different colors, but I loved the techniques you all used...I have some more ideas what to do with GM now! Thanks for the ideas! I have become a big fan of Glimmer Mist. I'd really love to see more of the Tattered Angels chalkboard mist coming out. I do have a few bottles of the Glimmer mists--TOTALLY in love with them! I watched a clip of Heidi Swapp demoing the Glimmer Glam, Glimmer Glaze, & the Chalks and I can't wait to try these beauties!! They really looked AMAZING!! Would love to try out masking technique more using the mist. Your great items make me want to try the Glimmer Mist. I'll have to go to my LSS to see if she sells it. Love these examples. Haven't tried Glimmer Mist yet, but want to try. Love your samples! I can't live without glimmer mist.... I love tattered angels products... the screens, the glass, the chips and now coming the glaze and glam it's playtime for me! I guess this is one of those products I just wasn't sure if I could do right so I haven't bought any yet. I would love to win some so I could try it for myself. Thank you so much for the opportunity to win. God bless! Love the projects. I have not used glimmer mist yet but would love to try some. I'm with Noel on this. Everyone should own at least a few bottles of Tattered Angel Mist. I found it to be the perfect answer when trying to match the colors of a wedding for an album. I sprayed a sheet of that intricate, lace cut paper (the laser cut kind) and adhered it to the album cover. I loved that I could go from light to dark with the same spray, adding color accents throughout monochrome album. would LOVE to TRY it! Looks fun and not so "scary" after you gals using it! Thanks for the Review and the chance! I LOVE Glimmer mist and have lots of bottles of it. Yup. Glimmer Mists pretty much ROCK! Would love to try the Chalk & Glaze types! great ideas and love the glimmer! I LOVE glimmermist, I've got about ten bottles and have five more coming from USA soon. Amazing creations - loving your reviews - has been quite helpful! Fantastic projects and great review! I love how your tag turned out, such pretty colours against the black! beautiful projects. I really want to try out the mist! I really want to get my hands on some of these! Glimmer mist is one of my favorites - not just to spray but also to watercolor paint with. It works great with a brush.